This article covers creating markers with the Pro Add-on installed and activated. Use this field to give a descriptive name for your marker. This shows up at the top of your marker’s InfoWindow when clicked on by a user. Insert the address or GPS coordinates of the location you want to mark. 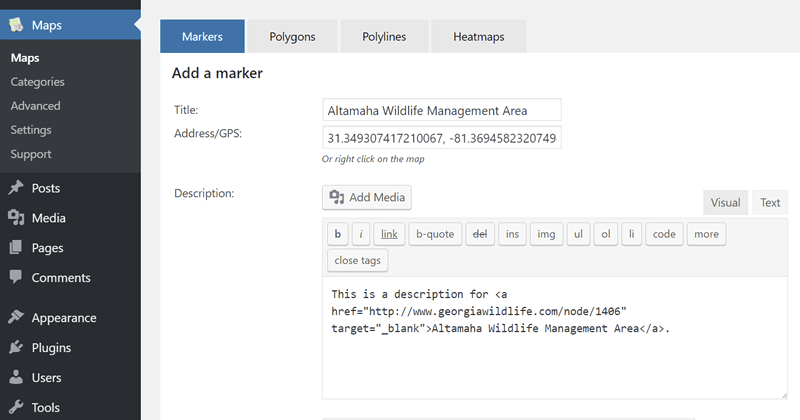 The plugin will place the marker on the map based on this setting. If the placed marker is not in the exact position you want, you can drag it to the preferred location after insertion. This is the only required field on this settings panel. Use this to describe your marker in more detail. In addition to the editor buttons, you can use HTML here (on the Text tab). 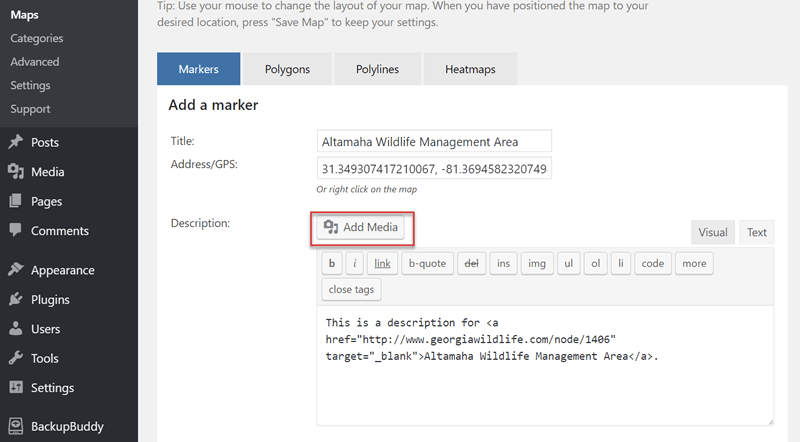 You can add media items (images, videos, documents, etc…) to the Marker Description using the Add Media button. After clicking the Add Media button, select the Media Library tab. Select a media item from the Library, modify any settings as desired, and then click the Insert Into Post button. After clicking the Add Media button, select the Upload Files tab. Here you can either click the Upload Files button and navigate to the file(s) you want to upload or simply drag and drop your files to the Upload Files panel. When done, click the Insert Into Post button. After clicking the Add Media button, click Insert from URL link in the left tab. Add the URL and the link text for your media, then click the Insert into Post button. If you want to use an image in the InfoWindow for your marker, either paste the full URL (including http://) to the image in the text box or click the Upload Image button to upload an image to the Media Library. If you would like a link in the marker’s InfoWindow, insert the full URL here (including http://). This URL will allow Visitors to open a web page from the marker’s InfoWindow. This allows you to use a custom PNG image as the marker icon instead of the default image (the red tear drop). If you want to assign the marker to a particular Category, select the Category (you must create the Category first). To create Map Categories see WordPress Dashboard → Maps → Categories. Select whether the marker’s InfoWindow is open by default. The default value is No, which shows the InfoWindow only when the Visitor clicks on the marker. After entering all desired marker settings, click the Save Marker button at the bottom of the panel. This covers setting your map type. If you need further assistance or are having other issues with the plugins, feel free to post on our Support Forums or visit our Support Desk.